Driving home yesterday I can to a stretch of road where the boughs of trees form a shady tunnel through which travelers pass. As a left the shade, I noticed purple wildflowers(Liatris scariosa I think) nestled in a patch of goldenrod. For once, there wasn't a car behind me so I braked and pulled off the edge of the road. I waded into the waist-high Johnson grass on the side of the road and leaned in close to the color on the bank and shot several photos. The wind was blowing which caused motion but I liked it anyhow. It was a good Friday. I hope yours was good as well. Yellow and purple are a lovely contrast. It sounds like a good Friday to me. Good stop, I love it when I have the road to myself! It's a wet Friday here in NJ, but we need it. Beautiful things. I hope your weekend lives up to your Friday. Glad you took the time to stop and get a picture. It's such a beautiful time of year, we need to take pictures because before we know it they'll all be gone until this time next year. Love that spot of violet in your photo. Great color combo. 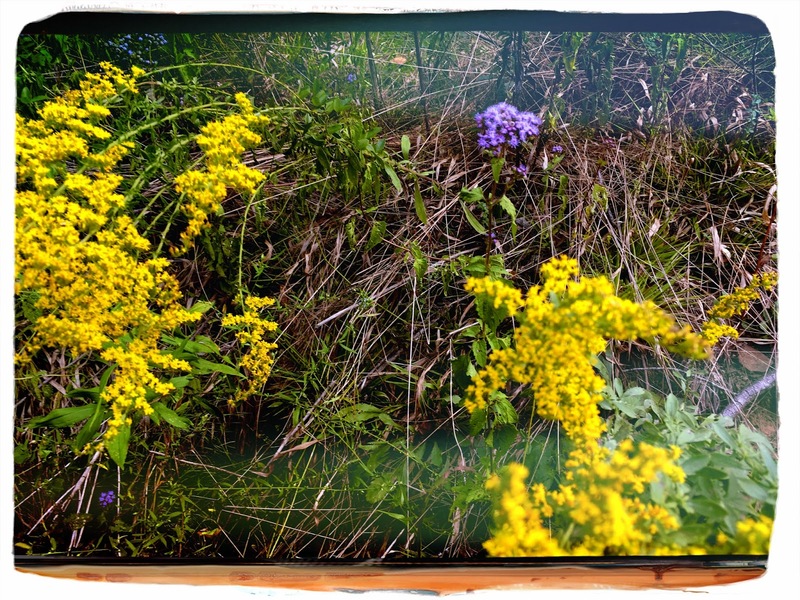 The bluish purple flower might be ageratum. There is a lot of it blooming now at our local botanical garden.